Houlston Manor is an unlisted mainly 17th century box-framed farmhouse, which has been substantially added to and altered over the years. In the early 19th century, the house was also ‘gentrified’ according to the fashion of the day when the timber-framed front wall was replaced with brick to create a unified exterior. Owned by the same family for generations, the current owner was born in the house and has lived there ever since. While the basic structure of the house – including the roof - was in good condition, the windows were in a state of disrepair. In addition, the southern gable end had been letting in wind-driven rain through failed pointing and, despite having central heating (installed in the 1990s) and insulated attic spaces, the house was not a warm one. The owner’s aims were threefold: to replace the rotten and draughty windows with new; to insulate the walls, and; to improve the appearance of the house by re-introducing the 19th Century symmetry. After choosing timber casement windows to replace the rotten sashes, a number of wall insulation solutions were considered. The owner decided that external insulation would help resolve the aesthetics issue and deal with both the threat of failing pointing and general poor weather-proofing. Houlston Manor is solid-walled and without a damp-proof course and the risk of moisture condensation within the walls was considered to be of paramount importance. The use of breathable materials, which would allow vapour transfer through the insulating layer, was essential and the Lime Green Warmshell system, which uses wood fibre board as the insulation layer and lime render as a weather-proofer, was judged to fit the bill. 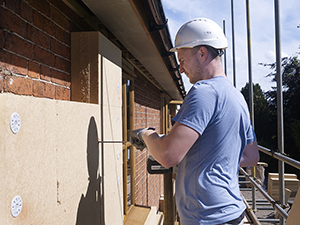 The sustainable Warmshell insulation system is flexible ad perfect for bringing an old traditionally constructed building up to modern energy efficiency standards. To install the Warmshell system at Houlston Manor, wood-fibre insulation boards were fixed directly to the external brickwork after excavating down around the sides of the house at ground level – a precaution taken as the house had different floor levels internally. 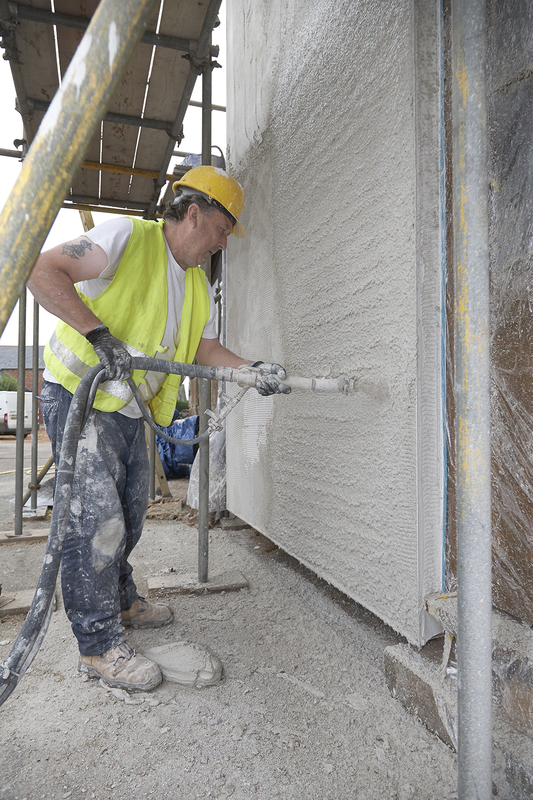 The insulation boards were then covered by two coats of lime render – a basecoat (with reinforcing fibreglass mesh) and decorative finishing coat. The eaves were also extended to ensure that the roof had significant overhang over the insulation and renders. Houlston Manor is now secure, warm and weather-proof for decades to come. In the first three months following the installation of Warmshell (in winter 2015), the property used 2800kWh for heating, compared to 6821 kWh in the exact same period the previous year. This represents an incredible 59% reduction in energy costs! As the original brick walls dry out and warm up over time, the owners expect to see even greater energy cost savings. Houlston Manor is now ‘fit for purpose’ for the 21st century and beyond, a warm, cosy and energy efficient family home that will last for many more generations to come.